The water, trees, sunshine, boats... all things that inspire me and make my spirit feel calm. 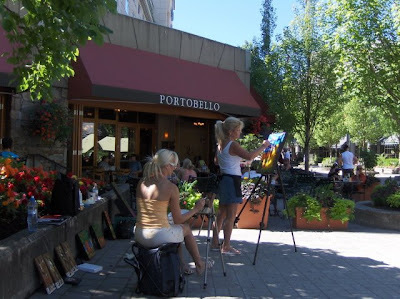 These two painters below really inspired me for my upcoming plein air painting weekend in Whistler with my artist friend, Lori. The traffic was pretty smooth flowing seeing it was a Friday and the fact that they're doing construction. 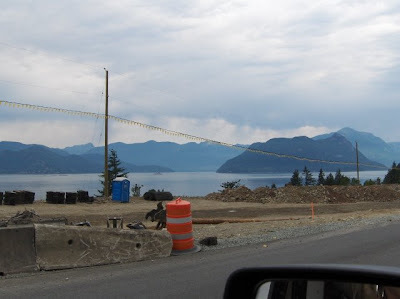 I know this photo isn't the greatest, but I love the Howe Sound view while driving up the Sea to Sky Highway. We got up early on Saturday and walked up to the Upper Village... a little nervous at first for fear that we would get "kicked out", but people loved us being there... we loved it too! This is the view across from where we were painting... we had a little lunch there. 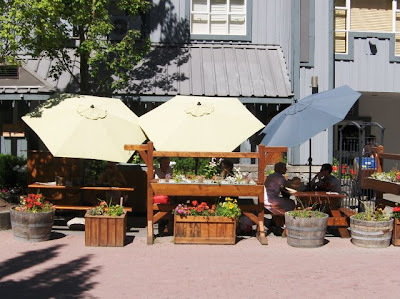 I thought it looked so European with the flowers and umbrellas. Heading home on Sunday, I stopped in at the Lions Bay Art Gallery. I've wanted to visit last time I was up that way, but the timing didn't work out. The gallery is run by artist Michael Tickner's wife, Alice Tickner. I have always been a fan of his colourful, cheerful work and have seen a lot of cards and prints of his paintings on Granville Island. Seeing as I had my truck full of art, I decided to show Alice. We chatted for about 2 hours or so about art, art careers, spiritual matters, artists... lots of stuff - she's so easy to talk to. She loved what I showed her and decided to represent my work. I'm pretty excited about it! On Wednesday, I'm going on a quick jaunt to Kirkland (just outside of Seattle) to visit Gunnar Nordstrom Gallery. It's the gallery that I show at and I just love meeting up with all the artists. Gunnar is very generous and also puts on a good show that everyone enjoys. Great networking and socializing. 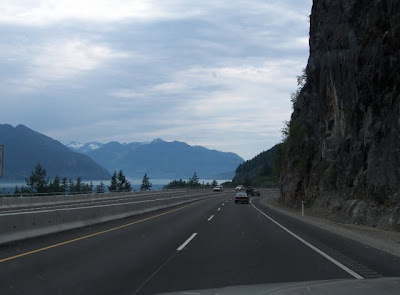 I love the road trip down there and being close to the water again. I'm going early on Wednesday morning... after my Valley Business Networking group meeting at 6:45am (we're reading a GREAT book right now: "Eat That Frog") and after teaching piano to my summer student (she's such a young, confident girl! 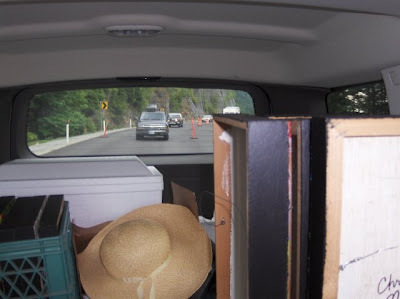 ), then I'm hittin' the road down south with sketch book, pencil and watercolours in the back seat. I'll take lots of photos. 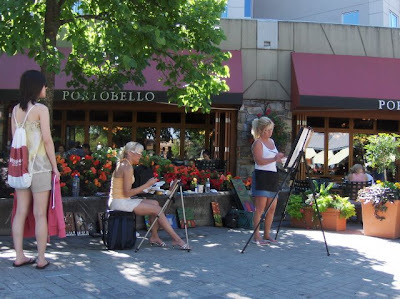 Next art trip: back to Whistler this weekend where my artist friend, Lori, and I are going to "set up shop" somewhere on the grass or something, paint and display our paintings. I can't wait to go and enjoy the mountains again. Until then... happy art adventures once again! Here we are with our lovely host, Shakuntla, from the Pacific Newspaper Group. The show started out with parachuters garishing Canadian flags and one jumper with an American flag. After the opening ceremony, we decided to go "walk-about" and check out some of the other tents. We didn't go too far as we saw that directly to the right of us was the Snowbirds' and Thunderbirds' tent. We mustered up some courage and walked in. Well well well... we found a volunteer to take a photo with us. I took a picture of Tracey with her phone, so I don't have it here. After speaking with Thunderbird pilot, Kirby, for a while, we spotted Major Charla... the totally amazing OBGYN surgeon and F16 pilot! What a personable, accomplished young woman - we were so impressed and asked her every question we could think of. As the afternoon progressed, we became mission oriented and were having a blast seeking out the men in uniform for photo ops! ALAS! A man brave enough to ink my skin with his autograph! Too fun! Tracey had her thigh autographed! He made our day... apparently we made HIS too! OK...next mission: see what other tents we can get into! We went to the President's Club tent and tried to walk in like we owned the place. Good try, but we were asked for ID pretty quickly (darn!)... shoed away like common people! (lol) Next... why not try the Executive Club tent. Well... we tried. One thing that was a "for sure": we had a great time! We're looking forward to more silly, youthful adventures - hopefully we'll never stop being young!